Primary growth takes place by the activity of apical meristematic cells of stem. Primary growth passes through following phases. Phase of Cell division: The numbers of cells are increased by mitosis during this phase. It occurs at the tip of root and shoot. These cells are smaller in size. They have spherical nuclei lying in the center of cytoplasm. They are non-vacuolated. After the cell division each daughter enlarges in size. Synthesis of cytoplasm and cell wall material also takes place in this zone. 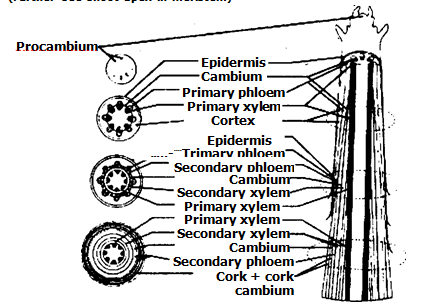 Phase of cell elongation:.The zone of elongation is present a little distance from apex of root and shoot. It is only a few millimeters in length. Thee cells take water during elongation and their volume increases up to 150 fold. Plasticity or the cell wall increases and wall pressure is reduced. Synthesis of new cytoplasm and cell wall material remain continue. Phase of maturation: The cell attains its final size during maturation The cell of pith, cortex and certain other tissues do not elongate further along the axis. But other cells like fibers and tracheid elongate lengthwise more than in other direction.